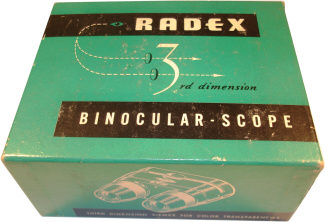 A Radex Viewer from around 1960, manufactured by Radex Stereo Co., Culver City, California. 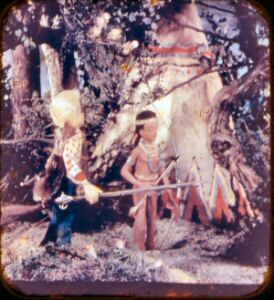 The viewer is made from cheap, light plastic and is not finished to a high quality, however it does function very well as a stereo viewer, giving a large and bright picture. Scans of a couple of Radex Slides. 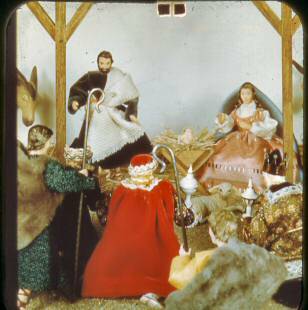 The one on the left is from a set titled, "Story of the Birth of Christ". 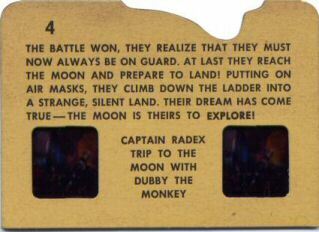 The slide on the right is from a set titled, "Captain Radex Trip to the Moon with Dubby the Monkey". 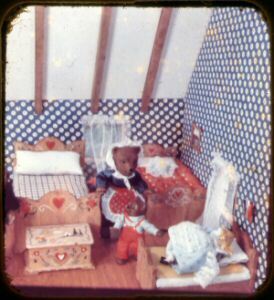 The slides offer good stereo depth. 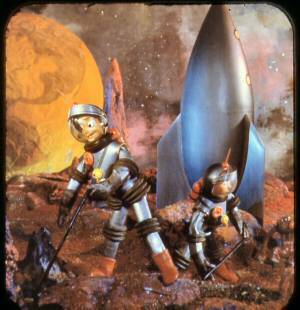 A later, more streamlined Story Time Radex Viewer. 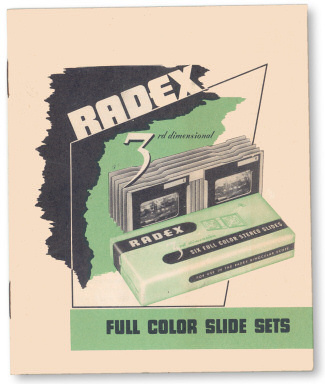 Some Radex slides were supplied in booklet form, consisting of six slides. together with an example scan from each set. 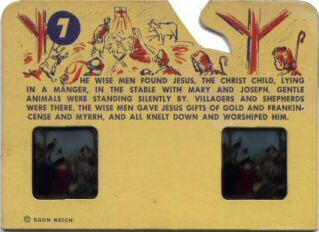 This up-market stereoscope was manufactured from metal and had a black crackle finish. 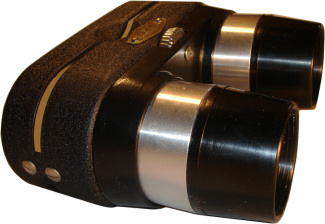 It is worlds apart from the plastic viewers show above and is a precision instrument featuring the ability to focus. 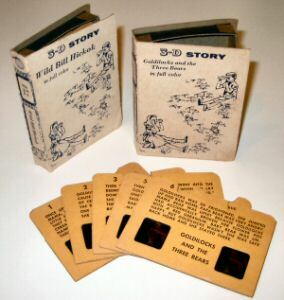 There was also a slide adapter that could be used with the viewer to allow the use of individual 35mm stereo slides, which were supplied in boxed sets of six. 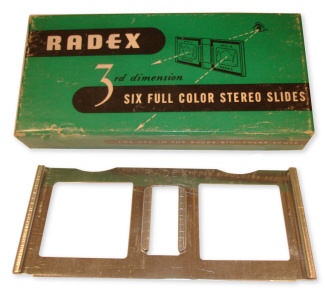 Radex manufactured slide sets covering several subjects, listed in the catalogue shown below, including aerial stereo photographs of cities, taken by E.D. McGlone. These pictures were taken from heights as great as 3500ft using a stereoscopic inter-ocular distance of up to 250ft and claimed to show dramatic depth. 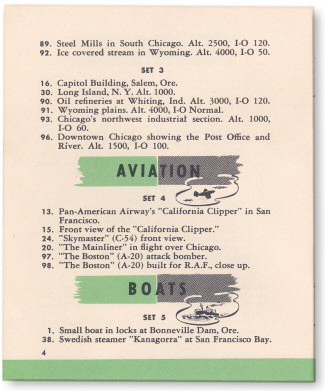 Other subjects included Aviation, Boats, geographic locations around the USA, Industry and Nature Studies. The catalogue gives the Radex Stereo Company address as 1328 West 6th Street, Los Angeles 14, California, USA.